Betstars is the brand new sports betting site from the company behind the famous PokerStars brand. Bet £20, get £20 in free bets! 1. Click the BetStars reveal code button just above. 2. Check the BetStars promotion code 2019 and ensure you fill it in on the registration form when prompted. At the time of writing, the requirement to enter a code has been removed. So now you don’t need to type in a BetStars promo code, just by using the button above you’ll qualify for the offer. Just ensure you read on so you’re aware of any requirements relating to the offer. What is the BetStars promo code 2019? So there’s no need to enter a Betstars bonus code to claim this free bet, but what does the offer actually entail? As shown on the banner above, the current deal is a “Bet and get promotion” – in this case, Bet £20, get £20 in free bets. To qualify, you need to deposit and place a bet of a minimum of £20. This bet needs to be at odds of even money (2.0 decimal) or greater, so pretty much anything other than a strong favourite will do the trick. Once this bet is settled, you’ll receive 2x £10 free bets, totalling the £20 the offer is worth. You are free to place these bets on anything you like, provided they are single bets. Is there a BetStars promotion for existing customers? Horse racing money back – get your stake back as a free bet if your horse finishes 2nd or 3rd. Spin and bet enhanced odds – see below for full details of this unique twist to fixed odds betting. Cash Out – now a pretty standard bookie feature, you’ll be pleased to know they offer this. Cash out your bet before the full time whistle. Acca insurance – Money back as a free bet if your fivefold acca misses by one. Bore draw money back – Money back as a free bet on various goal-related markets if it finishes 0-0. They also run regular promotions for specific events, be sure to click the promotions tab once you’re logged in to see the latest. These offers tend to be money back as free bet if you have a close call with an outright bet. 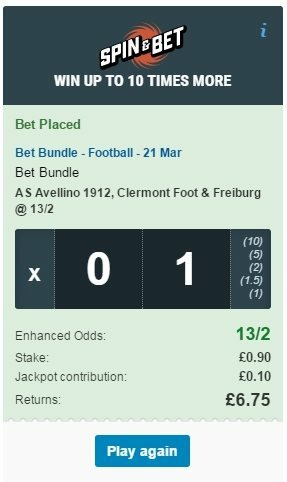 Nice little bonuses that make a difference to your betting. Betstars sport Bet £20, get £20 in free bets! Pokerstars Click claim to view the latest Pokerstars sign up offer. You might have seen the recent TV adverts for this, it’s a new an unique feature from BetStars that gives you the chance to enhance your odds by up to x10! They call it a game changer, and it might just be, it really is a fantastic new addition to the format. It works by taking a contribution from your stake (10%) in exchange for a spin of the multiplier wheel. You could be rewarded by up to 10x the odds, making a 2/1 shot a huge 20/1, or an even money shout a tasty 10/1. If you don’t get the top multiplier, there are others along the way that still enhance your odds, with x5, x2 and x1.5 all giving your bet a nice boost. This one was a x1 so it was a normal bet at the original odds, you only lose out by the small percentage that goes into the enhanced odds pot. If you choose your bets wisely you’ll find you can get decent odds for a selection even at x1, with the chance of hitting one of the bigger multipliers into the bargain. The terms of the sign up bonus can be found on the BetStars promotional page. It is your responsibility to read and understand them before taking advantage of this promotion. Please ensure you do so. Previously we have reproduced terms and conditions for sign up offers, but we no longer do this. You must always refer to the bookmakers own site now. Below are terms and conditions reproduced from an earlier offer. They are no longer valid and are retained solely for reference. These relate to the previous promotion, which is the expired Bet £10, Get £20. UPDATE – we have removed our summary of the earlier T&Cs, please refer to the bookmakers site for all offer terms.